There seems to be new ways to reinvent Shakespeare everyday. Spearheading this movement is Bottoms Dream, an ambitious company that thrives on weaving new interpretations of the Bard's text to create new narratives. In The Bride, their latest weaving, Love’s Labour’s Lost and Much Ado About Nothing get the mashup treatment for a story about, well you guessed it, love. Playing the Gallery at The Access Theater, The Bride, adapted by Nat Angstrom, takes two of Shakespeare's romances and shakes them up to tell a tale of gender divide after The King of Navarre decides that there is a ban on gender communication while he spends three years at study. As the outlaw is in place, the comedic policing of Dogberry, master constable of The Watch, takes center stage as he has a duty to be done. 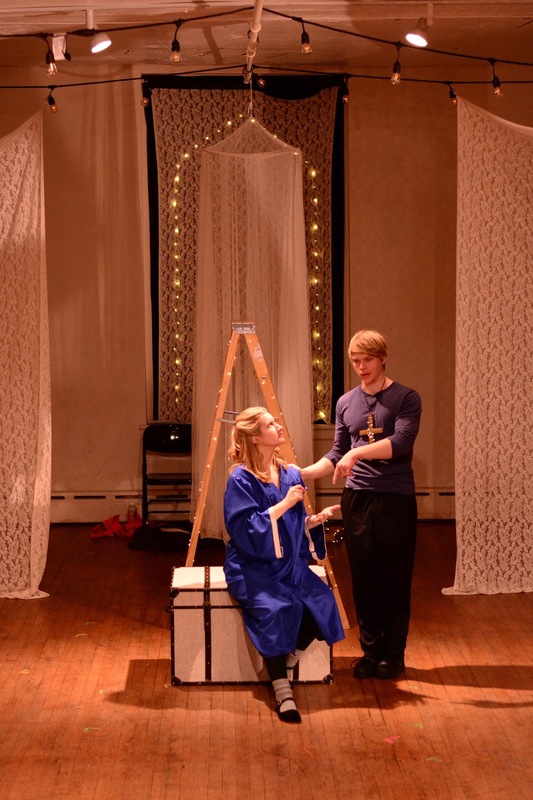 The Bride is a play for Shakespeare aficionados. In the grand scope of the canon, these two are probably somewhere in the lower middle tier of popularity. That being said, the clarity is not here. It may be best to engage in a quick crash course refresher on the respective texts, character, themes and plots before spending the night at the theater. To bring this new story to life, characters' texts were combined to create new, and occasionally, similar personas. But as the story unfolds, The Bride is not quite a weaving, it's more like patchwork. These aren’t instantly recognizable narratives so throwing a new one into the fold may have been the cause of disconnect. Even if you try to take the piece at face value, the individual arcs of the characters needed more care. Maybe even some sort of dramaturgical program to peruse prior to the production explaining some of the combinations of characters and analysis of the source material as it pertains in this context could have been useful. Even if you have difficulty following along, where The Bride succeeds is in the consistent physical vocabulary in direction and utilization of instruments and integration of music. Director Doug Durlacher had a strong vision when it came to bringing out what The Bride would look, feel, and sound like. There was an inherent fluidity in his staging. The scenic exploration was transformative for the space. The aesthetic was all there. What was missing was the connection of the material from page to stage. Durlacher’s storytelling needed some finessing. The piece began with the players, all of whom were seen warming up as the audience walked in, setting the stage by removing props and costumes from a trunk center stage. Accompanied by a musical underscore, this prologue was important. It had parts of the narrative within. Again, aesthetically it was gorgeous. It could have been amplified even further to hammer in just how much we needed it. Where The Bride flourished was the use of music throughout. Music is in fact the food of love. With original songs from Mike Lee, Allyson Capetta and the ensemble, its integration elevated the production. Taking on a plethora of personas, the ten actors found love in the text. And when there is heart in a character, there is an attraction toward the performance. The multi-talented cast showcase their skills from characterization to musicality. The strongest of the bunch included Aleda Bliss as the Princess of France, Katie Fanning as Rosaline, Ella Smith as both Hero and Holofernes, and scribe Nat Angstrom as Dogberry. The Bride is a new story. And that’s ok. Sometimes it’s exciting to reinvent the wheel. But the execution needs to be exceptionally flawless. Unfortunately the text got bogged down in idea.